Buddha’s hand citron is an ancient citrus variety, and one of the most interesting looking as well. What can you do with this Buddha’s hand citron in the kitchen? A lot! Some of the potted citrus plants growing at Tyrant Farms. 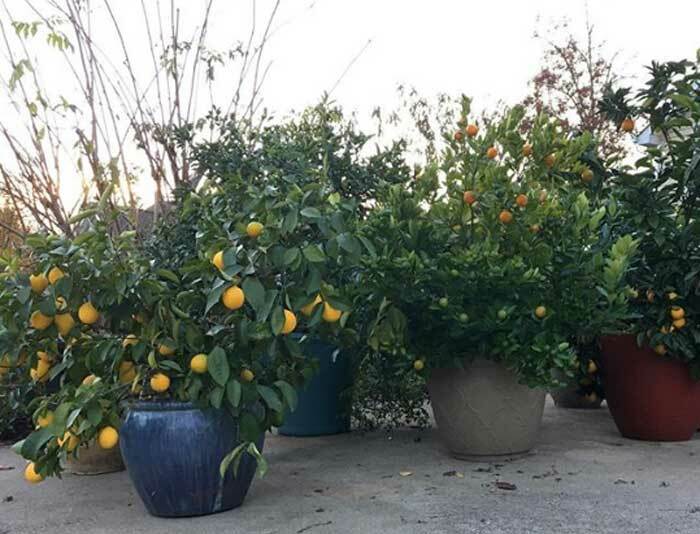 As such, each fall and winter day when the temperatures drop below the mid-30s, we roll our large citrus pots into one side of our garage or into our dining room. 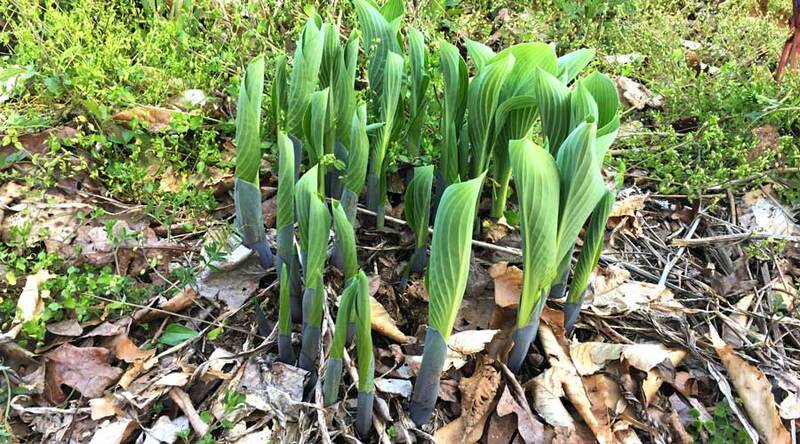 During the rest of the year (or on days when temps are 40+ degrees), the plants are outside. Yes, most citrus varieties–especially when they’re mature–can tolerate freezing temps, but they don’t necessarily enjoy it. There are an astounding number of citrus varieties out there, many of which you’ll never see at a grocery store. Currently, we’re growing blood oranges, makrut limes, meyer lemons, pink ‘lemonade’ lemons, satsuma mandarins, kumquats, red finger limes, calamondin oranges, and Buddha’s hand citron. 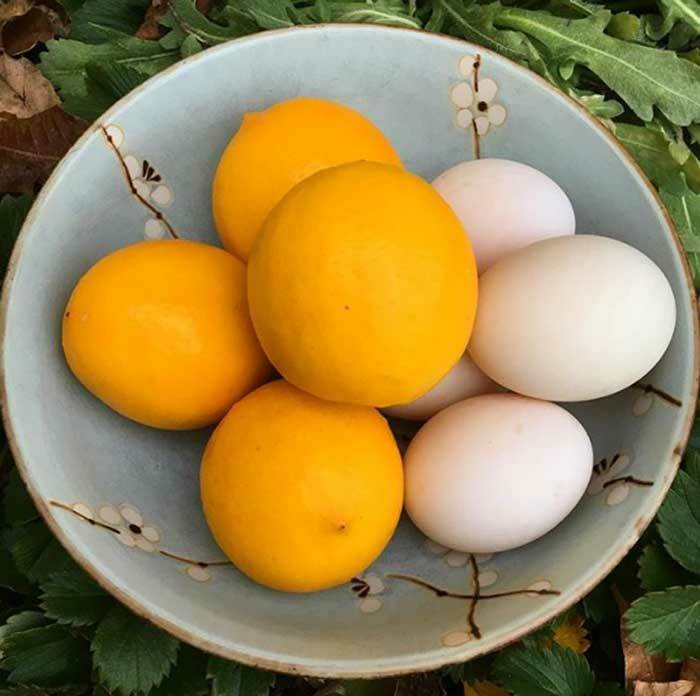 Our favorite thing to do with meyer lemons is make lemon curd, which uses both the zest and the juice of the fruit, along with ducks eggs from our Welsh Harlequins. Buddha’s hands citron hands? Why not. 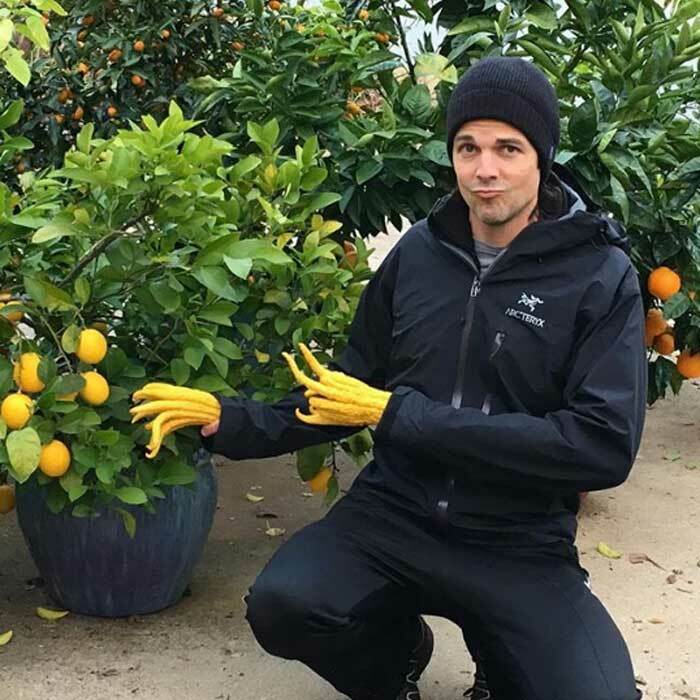 Making a weird face while tending our potted citrus on a chilly day. Citron (Citrus medica) may be the oldest of these four, and Buddha’s hand citron (Citrus medica var. sarcodactylis) is likely not that far removed from the original wild version of the fruit. One of the many fun things about growing food is that you can grow unusual things you can’t usually find at the grocery store. Buddha’s hand citron (left), Hibiscus sabdariffa calyxes (center), and makrut limes (right). Yum! The shape of a Buddha’s hand citron fruit resembles a human hand, albeit bright yellow with quite a few more fingers. Come to think of it, if your hand ever looks like this, please consult your physician! Each Buddha’s hand citron cultivar is a little different: some have “open hands,” some have “closed hands.” Ours seems to produce both open and closed hand fruit. 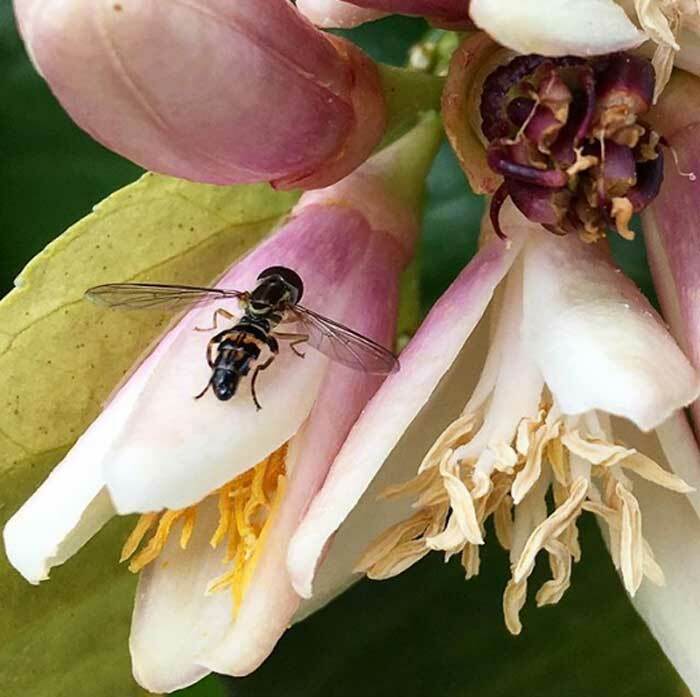 Pollinators, such as our neighbor’s honeybees, LOVE our citrus flowers. Here’s a native syrphid fly (a great pollinator and predator) foraging on our Buddha’s hand flowers. Buddha’s hand citron earned its name partially due to its hand-like shape and partially because it has long been used as a ceremonial offering at Buddhist temples. FYI if you plan to offer a Buddha’s hand citron to Buddha at a temple, he prefers closed handed fruit since it better symbolizes prayer and meditation. A ripening Buddha’s hand citron. 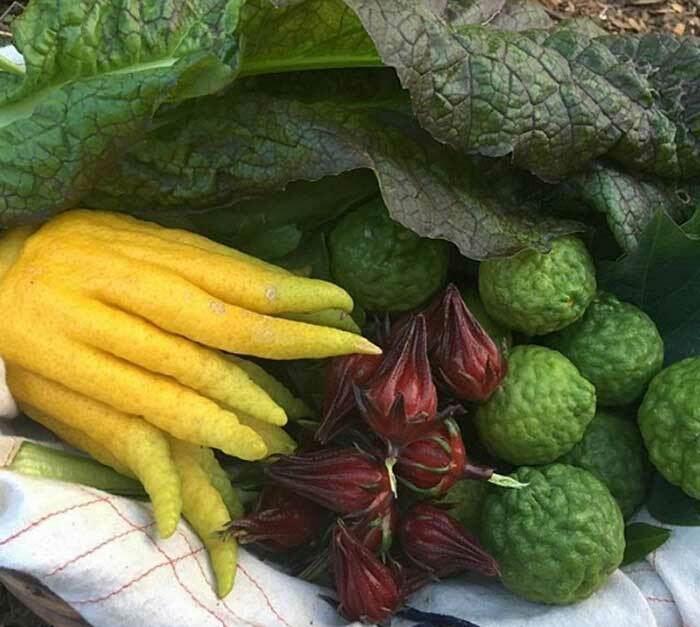 What Can You Make With Buddha’s Hand Citron? You won’t be using Buddha’s hands citrons for fresh eating or to make lemonade. That’s because most cultivars, like ours, don’t have any pulp/juice inside. 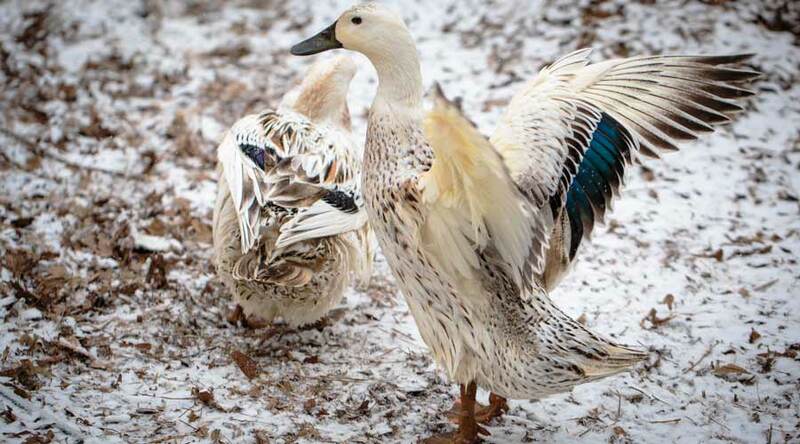 They’re all skin (flavedo) and pith (albedo). Unlike many other citrus varieties, however, the skin and pith of Buddha’s hand citron is sweet and mild, with barely any bitter. So, what the heck do you do with such a fruit? Our favorite use thus far? Buddha’s hand candy. 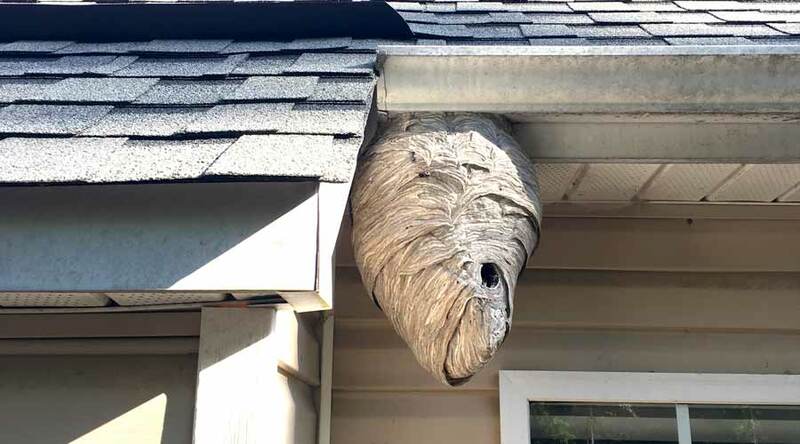 One of the best things about this recipe is that it’s actually a 3-in-1 because you’ll get sun tea, candy, and simple syrup by the time you’re done. Top: the starting point – citron is sliced uniformly to about 1/3″ thick to reveal the beautiful flower pattern. If it’s warm and sunny out, start by making these into sun tea, otherwise blanche them on the stove to help remove any bitter in the final candy. Bottom: the finishing point – Buddha’s hand citron candy. 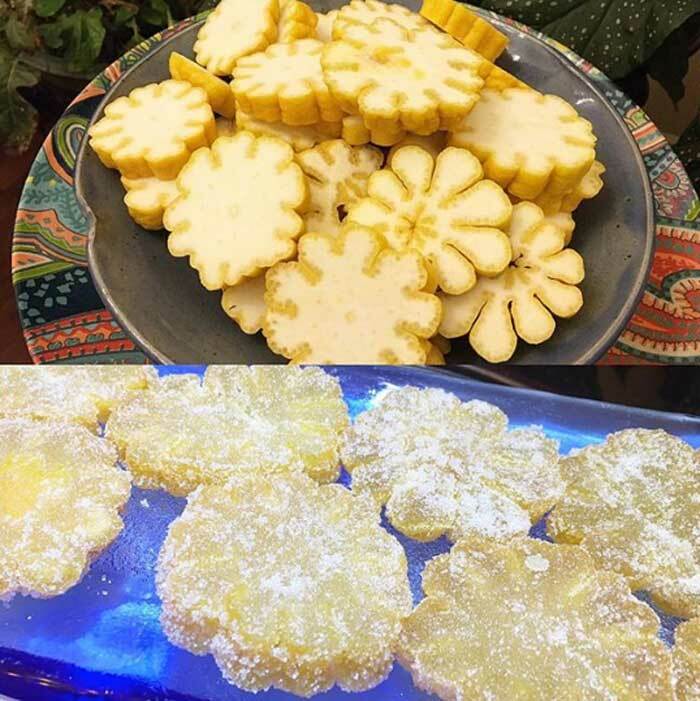 Once you're done making Buddha's hand citron sun tea (6-10 hours), strain out the citron to make this delicious candy recipe, then save the left over simple syrup for drinks, sorbets, and more! Cut each citron into ~1/3" thick slices (see photo above) to reveal the internal flower shape. 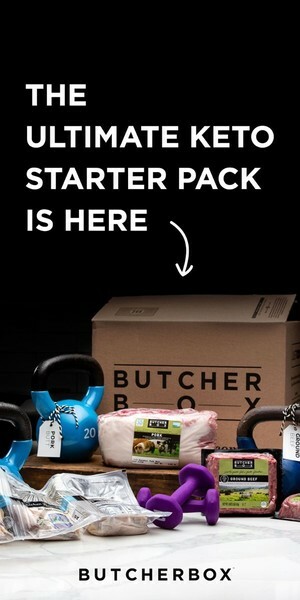 Use the "finger" pieces too. (Option A: Sun Tea) If it's warm (over 70 degrees) and sunny out and you'd like to make sun tea, place the slices into a jar and fill with water. Put jars in a sunny spot for the day. Strain out citrus to make candy and put "citron tea" into fridge until ready to drink (sweeten to taste). (Option B: No Sun Tea) If it's cold or you're in a rush for time, jump right in to candy-making mode. You'll need to blanche the citron to remove the bitter flavor. Put the citron slices into a pot and cover with water. Simmer (low boil) just long enough to make pieces translucent (30-40 minutes). Pour out water. Add 5 cups water back to the pot + sugar. Cook just until the temperature of the mix reaches 230 degrees F. A candy thermometer is REALLY helpful for this. Remove from heat and allow to cool. Pour the citrus-flavored simple syrup from the pan into jars and refrigerate until you're ready to use them. Strain the citron pieces out and place them on cooling racks to dry for 24 hours. 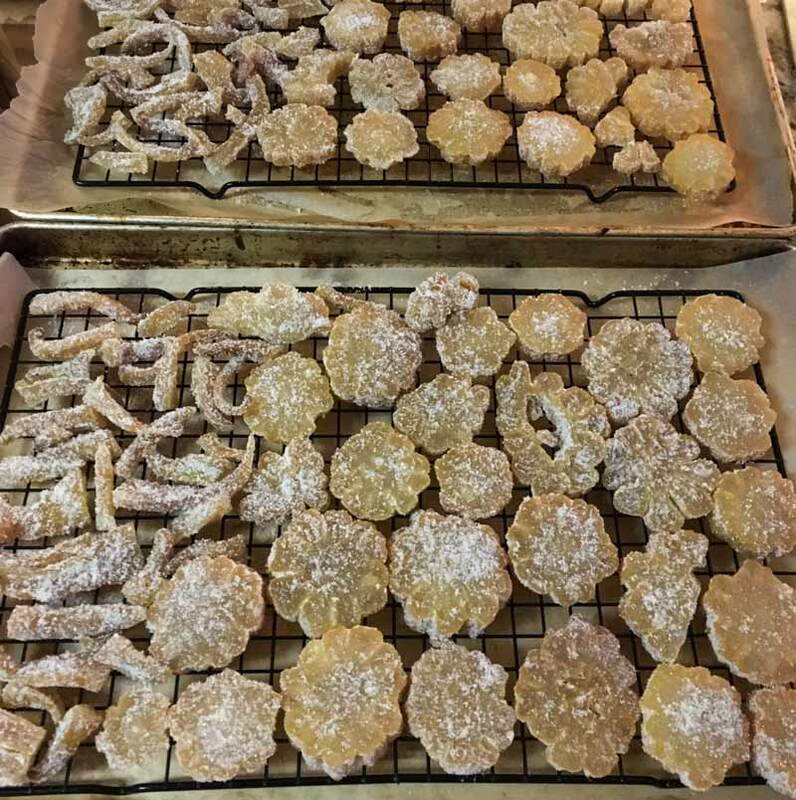 If candied pieces are still tacky/sticky after initial sugar coating, toss them in sugar one more time and allow to dry for another 1-2 days on racks. 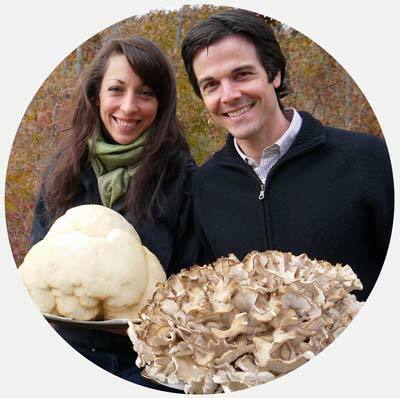 Once dried, place in airtight container in refrigerator for long-term storage (more than 1 month). 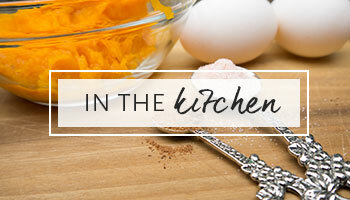 If you plan to eat them within a couple of weeks, you don't have to refrigerate them. 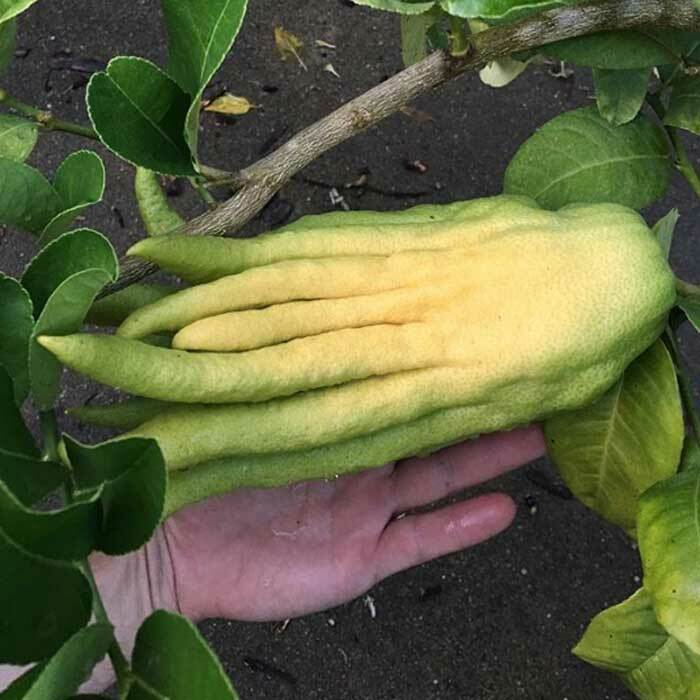 If you’re like us, there’s zero chance you’re going to find a Buddha’s hand citron bush for sale at your local plant nursery – and you’re probably not going to find the fruit at the grocery store. The good news is you can get a 24″-36″ tall tree delivered straight to your door from Sheila’s Tropicals via Amazon. 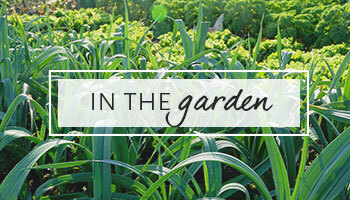 If you do start growing your own citrus, we highly recommend using organic methods. 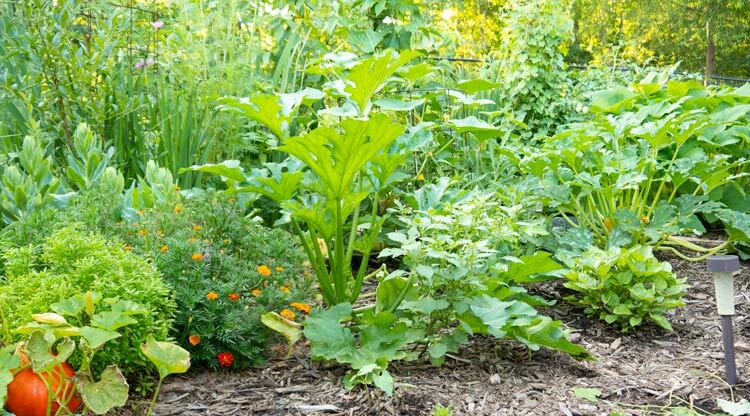 Fertilizer – We only fertilize with compost, compost tea, liquid gold, or kelp emulsion. Pest Control – In the winter when our plants are indoors and predatory insects aren’t around, we sometimes get spider mites or scales. 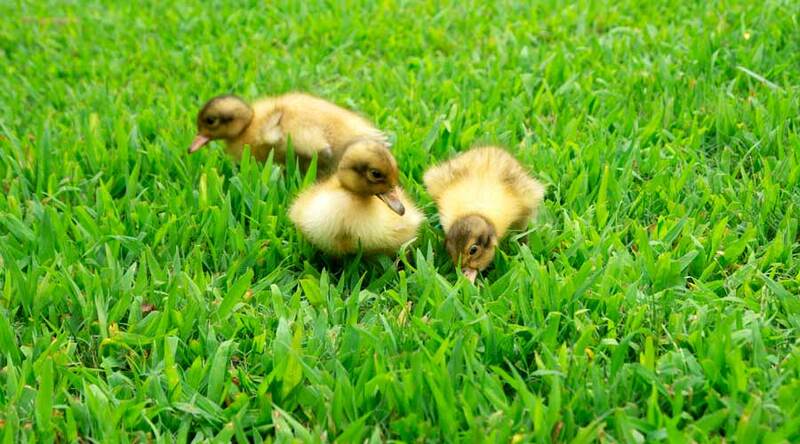 If/when that happens, we use organic, OMRI listed products: neem oil, or mineral horticultural oil. Buddha’s hand citrus candy drying on cooling racks. Oh, and if you want to pick up a candy thermometer to help with this recipe or others like it, here’s a good one!